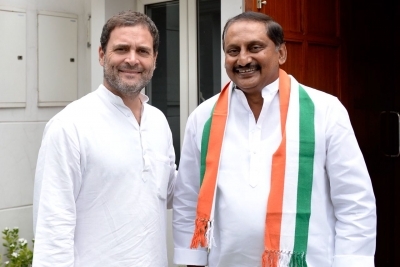 New Delhi July 13 (IANS) Former Andhra Pradesh Chief Minister N. Kiran Kumar Reddy on Friday rejoined the Congress that he had left in protest against the bifurcation of the state in 2014. Reddy went to the Congress headquarters here on 24 Akbar Road and rejoined the party in the presence of General Secretary and former Kerala Chief Minister Oommen Chandy and party leader Randeep Singh Surjewala. Earlier in the day Reddy met party President Rahul Gandhi. He was the last Chief Minister of the united Andhra Pradesh before the formation of the Telangana state on June 2 2014. He had succeeded K. Rosaiah as Chief Minster in 2011.